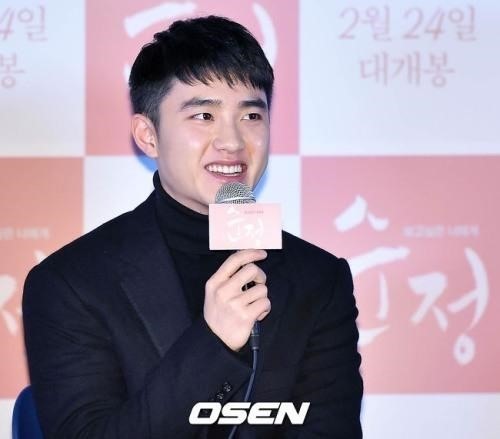 Boy band EXO’s Do Kyung-soo, who is also known as D.O., said he wants to play an evil role in a recent interview with entertainment media Herald Pop. The 23-year-old began his acting career with hit TV series “It’s Okay, That’s Love,” which aired in 2014. He is also starring in two upcoming movies “Unforgettable” and “Older Brother”, which will both be released this year. The singer-actor will play an innocent boy who devotes his love to a young girl in “Unforgettable,” which will open in theaters on Feb. 24. D.O said that he wants the chance to take on an entirely different type of role. “I want to play an evil role like Tom Hardy’s portrayal of John Fitzgerald in ‘The Revenant.’ Although I am not sure whether I can portray such characters well, at least I would be able to discover a new side of myself,” said D.O who added that the American movie “The Revenant” is his favorite film. “At first, I just saw the film from the perspective of an audience. But after watching it twice, I realized how great the director was,” he added.